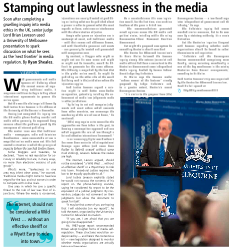 Soon after completing a gruelling inquiry into media ethics in the UK, senior judge Lord Brian Leveson used a University of Melbourne presentation to spark discussion on what he sees as the ‘next frontier’ in media regulation. Ryan Sheales reports. With governments and media tycoons still bickering about the correct means of regulating traditional media, it may seem ambitious to begin talking about international agreements to govern the online space. Yet this was the challenge laid down by Lord Justice Brian Leveson in his address at the University of Melbourne in December. Having just completed his inquiry into the UK media phone-hacking scandal and media ethics generally, he expressed deep concern about the problems posed by the emergence of internet publishing. The central issue was that traditional media – newspapers, radio and television broadcasters – were accountable at law in ways that online media were not. This had created a situation in which the principle of equality before the law had broken down. Some bloggers and tweeters, he declared, “have no real reputation for accuracy or reliability but are, in many ways, no more than electronic versions of pub gossip”. What’s more, “lawlessness in one area may infect other areas,” he warned. Traditional media might come to have less regard for the law, and cut corners in order to compete with online rivals. One area in which he saw a specific threat to the rule of law was that of injunctions. Where the media is concerned, injunctions are usually directed at prohibiting or limiting what can be published about a person in order to prevent what the court regards as harm, unfairness or interference with the administration of justice. People who ignore an injunction are in contempt of court, and traditional media — with their names and addresses known, and with identifiable personnel and assets — can generally be located and prosecuted with comparative ease. By contrast, a blogger who might or might not use his own name and might or might not be traceable, would be difficult to prosecute for the same offence. This difficulty is magnified by the fact that in the global online world, he might be publishing on the other side of the world but being read in the jurisdiction where the injunction applies. Lord Justice Leveson argued a solution might lie with better cross-border co-operation, potentially including the enforcement of media law judgments made in other jurisdictions. “By failing to act and recognise judgments and court orders which emanate from other countries, we encourage the weakening of the rule of law at home,” he cautioned. In an increasingly digital world where it has never been easier to inflict reputational damage upon others (and never been harder to defend oneself without some mud sticking), Leveson believes the stakes are high. Lord Justice Leveson explicitly stated he would not canvass the contents of his report on the phone-hacking scandal, saying he considered his report to be the equivalent of a judicial judgment. By convention, judges do not comment on their judgments but allow the document to speak for itself. “It may be that some of you are hoping that I will elaborate [on my report]”, he told the event, organised by the University’s Centre for Advanced Journalism. His 1987-page report recommended Britain adopt tougher forms of media self-regulation. These structures would be underpinned by — and here’s the contentious bit — new legislation designed to monitor whether media organisations are actually behaving themselves. As a counterbalance this new legislation would, for the first time, also enshrine freedom of the press in British law. The recommendations generated mixed opinions across the UK media and political circles, including within the ruling Conservative-Liberal Democrat Coalition Government. But might this proposed new system be something Australia should consider? The Centre for Advanced Journalism’s Dr Denis Muller followed the Leveson Inquiry closely. The veteran journalist and media ethicist had been a consultant to the Australian Government’s own Independent Media Inquiry, headed by former Federal Court Judge Ray Finkelstein. Dr Muller says the Leveson model “echoes several of the features” already proposed by Judge Finkelstein and, to a greater extent, Australia’s recent Convergence Review. This article first appeared in VOICE, a publication of the University of Melbourne. “It is similar to the proposal from [the] Convergence Review — a law-based regulator independent of government and the industry,” he says. The Finkelstein Inquiry had recommended similar measures, but to be overseen by a statutory authority. It’s a crucial distinction. But the Australian inquiries disagreed with Leveson regarding whether media organisations should be forced to submit themselves to self-regulation. “Finkelstein and the Convergence Review recommended compulsory membership, seeing voluntary membership as one of the key weaknesses in the existing Australian Press Council arrangements,” according to Dr Muller. Previous Post What do you mean PR flacks don’t eat their young? Next Post Etch-a-Sketching out a path to an Australian Republic.